- See more at: http://blogtimenow.com/blogging/automatically-redirect-blogger-blog-another-blog-website/#sthash.s1ipfCM1.dpuf CatholicTV: CatholicTV.com turns over One Million! CatholicTV.com turns over One Million! The new, user-friendly and visitor-interactive website for The CatholicTV Network (www.CatholicTV.com) reached a critical milestone today: 1,000,000 unique visitors. These visits come to Your Catholic Broadband Network® from all fifty of the United States and 202 other nations, worldwide. 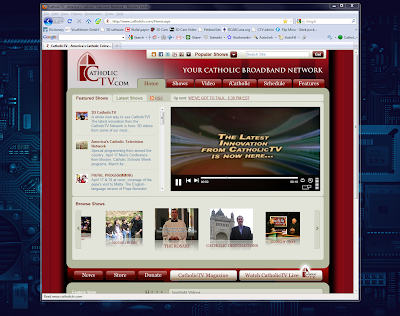 At over 1800 pages with 1483 unique, full-length episodes of original and acquired media, CatholicTV.com boasts of being the most comprehensive library of Catholic video in the world. Representing the Church in the United States and throughout the world, portraying the Faith alive in the parish, to the many dioceses of the United States, even to the Vatican, CatholicTV is always there for you, 24 hours a day, 7 days a week. With a high quality live stream, you can watch CatholicTV anywhere there is a broadband internet connection.